NO. GOD DID NOT CREATE US TO BE THAT WAY. Because of the fall of our first parents, WE BECAME EVIL MURDERS. We weren't created to be like that. Now, to get out of this mess, WE MUST ACQUIRE THE SUBSTANCE OF GOD. IN NO OTHER WAY CAN WE GET RID OF SIN AND THE INCLINATION TO SIN. DIVINE LOVE IS THE KEY TO THE KINGDOM OF GOD. NOTHING ELSE GETS YOU THERE. THE WORLD AS WE SEE IT IS OUR CREATION, NOT GOD'S. God threw us on this planet with Love. We gave away that love so that we could practice sin. God will wait for us to become Love again. God puts us here alright but their are so many different qualitys of life- all the way from a single cell organism to us humans,why does one deserve better than the other? youve also said that we came from the spiritual world straight away to live here then we go straight back,again this is like God playing with an ant farm-for his enjoyment we all suffer.God wants us to experience this life for him you said-.........God dos'nt want anybody suffering,He could end all suffering right now if He wanted,but because we accumulate karma we have to live out certain lives, some people are worse than others and deserve everything thats coming. I asked if there was any evidence that you could present to us that would confirm your belief. Now I can do this with the Bible, because it contains hundreds of prophecies that confirms who Jesus Christ is. And accurately fortells future events. Yet, what evidence is to be found in the Bhagavad Gita that would confirm it contains such advanced knowledge? A knowledge, that could only come from God. Because only the real God, knows the future. How can you know that the bible accurately predicts future events? The future hasn't arrived yet, and so far not a single biblical prediction has been fulfilled. According to the Bible, the Jewish people would one day return from a worldwide exile. They would return to the land of Israel. They would retake back their city of Jerusalem. 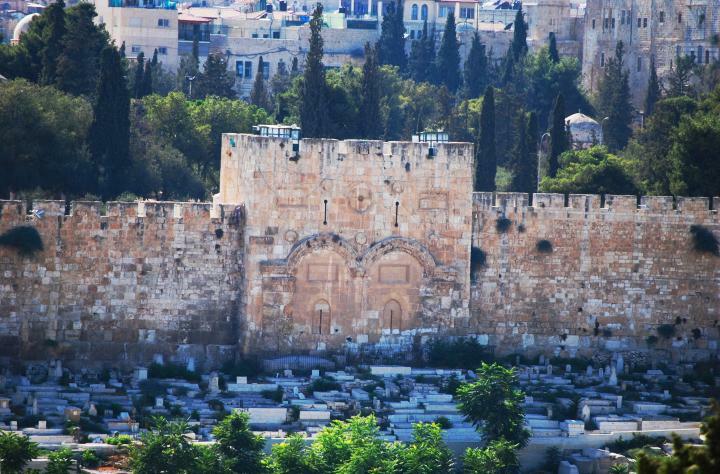 And at the sametime, we would see a sealed East Gate, that was still attached to an even older East Gate that would lead to the temple mount. And in this sametime, the people of Israel would be demanding that their third temple be rebuilt. Also, these prophecies would only occur in a time, when nations to the East of Israel would be able to field an army of 200 million, if the need arises. The furture arrived when Jesus Christ first fulfilled more then three hundred prophecies of the Old Testament 2,000 years ago. Israels existance today, has just added to the number of fulfilled prophecies. To suggest that not a single prophecy has been fulfilled, requires you to turn a blind eye to some of our most obvious history. Gods knowledge does not place limits on man's ability to accept Him. Man being evil, makes his own choices. And veda literatures may of predicted the birth of some. Yet not one of those incarnations, will grant man eternal life. Only God's blood sacrifice found in the person of Jesus Christ. Can do that. Last edited by dobeable; 03-18-2010 at 08:13 AM..
you only know the bible therefore your knowledge is limited,not all men are evil and if you think that the All Loving Being is going to send his own children to an eternity of Hell just because they fell into temptation then you are suggesting that God Himself is evil,their is no justice in sending someone to eternal hell,and the probly the only reason why your a christian is because you fear this place,if you want to rabbit on about the bible then i suggest you go to a different thread"
As I said...all in the future...Prophesy fail. Yes I know....All the prophesies from the old testament conveniently written and "fulfilled" in the new. Since the writers of the new read the old, they are not valid.....Prophesy ....EPIC fail.